Drain spinach, and press between layers of paper towels until barely moist; set aside. Clean mushrooms with damp paper towels; remove stems. Finely chop stems; set aside. Coat a large nonstick skillet with cooking spray; place over medium-high heat until hot. 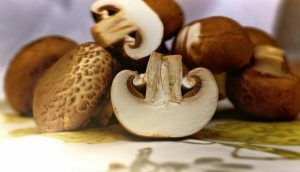 Add mushroom caps, stirring constantly, 5 minutes. Drain. Place caps on rack of a boiler pan, stem sides up; set aside. Combine spinach, chopped stems, yogurt, and next 8 ingredients; spoon evenly into mushroom caps. Sprinkle evenly with 1 tablespoon Parmesan cheese. Broil 5 1/2 inches from heat 5 minutes or until thoroughly heated. Serve immediately. Yield: 20 servings (serving size: 1 stuffed mushroom).